This module allows you to integrate your Facebook site with your PrestaShop store. Our module and special application adds a tab on the Facebook Fanpage with special sales that you have defined in the store. Get more customers and increase your sales! Facebook sales tab is a PrestaShop module, which can increase the number of customer visits and boost your income. Our solution integrate your shop with Facebook Fan Page by adding a special "Sales" tab into it, where user gets completly list with products in sale from your shop based on PrestaShop engine. Check Prestashop Facebook sales tab demo. Our product consist of two parts. The first part is a module that you must install in your store, second part is an application on Facebook that allows you to add the "Sales" tab into any fan page you want. Of course you can create you own application, but we guarantee that our app will be works perfectly. Moreover: our app is based on our SSL certificate , so "sales" tab will work for everyone, also users with Facebook "safe browsing" turned on. You can check application here: PrestaShop sales Facebook App . We create it because we want to offer a fully comprehensive product and we want to help you with integration and installation process. As we say, our app uses SSL certificate especially for secure browsing for your users. What does it mean? It mean that every user with Facebook "safety browsing" turned on can get access to "sales" tab. Its important, because without SSL certificate it wasnt possible. Prestashop module is most important thing in Facebook sales tab product. With this addon you can create you own "sales" tab content. With module you can personalize your "sales" tab. In PrestaShop back office you can specify most important module settings. All features of Facebook sales tab module and product are described below. 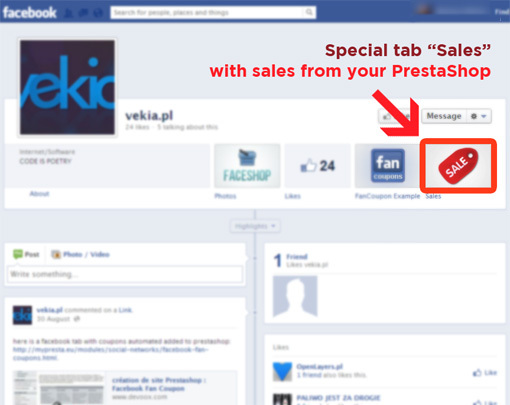 Install the our facebook app " PrestaShop Sales " on selected fanpage. You must accept permissions to work properly with it. We user permissions only for installation process. 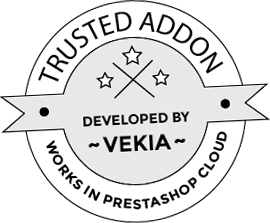 In app settings type the URL to your shop like: "http://prestashop.vekia.pl/" and specify the height of "sales" tab. Now you can install the Facebook sales tab module in your PrestaShop back office.